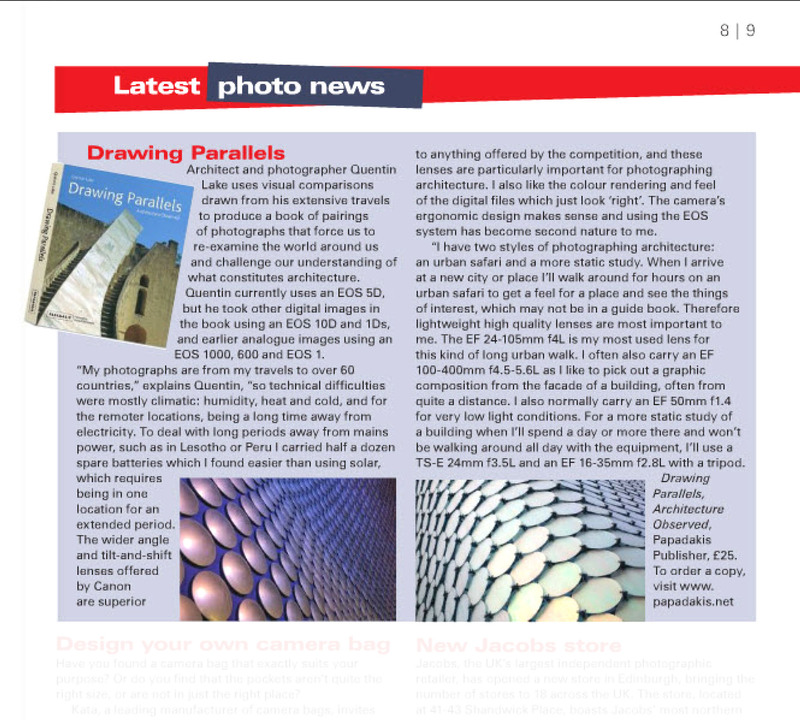 An article on the book Drawing Parallels: Architecture Observed in EOS Magazine January-March 2010 focusing on technique and equipment selection from the Canon EOS system best suited for Architectural Photography. Architect and photographer Quintin Lake uses visual comparisons drawn from his extensive travels to produce a book of pairings of photographs that force us to re-examine the world around us and challenge our understanding of what constitutes architecture. Quintin currently uses an EOS 5D but he took other digital images in the book using an EOS 10D and 1Ds, and earlier analogue images using an EOS 1000,600 and EOS 1. ‘My photographs are from my travels to over 60 countries,” explains Quintin. “so technical difficulties were mos!ly climatic: humidity, heat and cold, and for the remoter locations, being a long time away from electricity. To deal with long periods away from mains power, such as Lesotho or Peru I carried half a dozen spare batteries which I found easier than using solar, which requires being in one location for an extended period. “The wider angle and tilt-and-shift lenses offered by Canon are superior to anything offered by the competition, and these lenses are particularly important for photographing architecture. I also like the colour rendering and feel of the digital file. which just look ‘right’. The camera’s ergonomic design makes sense and using the EOS system has become second nature to me. “I have two styles of photographing architecture: an urban safari and a more static Study. When I arrive at a new city or place I’ll walk around for hours on an urban safari to get a feel for a place and see the things of interest, which may not be in a guide-book. Therefore lightweight high quality lenses are the most important to me. The EF 24·105mm f4L is my most used lens for this kind of long urban walk. I often also carry an EF 100-400m f4.5-5.6L as I like to pick out a graphic composition from the facade of a building, often from quite a distance. I also normally carry an EF 50mm /1.4 for very low light conditions. For a more static study of a building when I’ll spend a day or more there and won’t be walking around all day with the equipment, I’ll use a TS-E 24mm f3.5L and an EF 16·35mm f2,8L with a tripod.